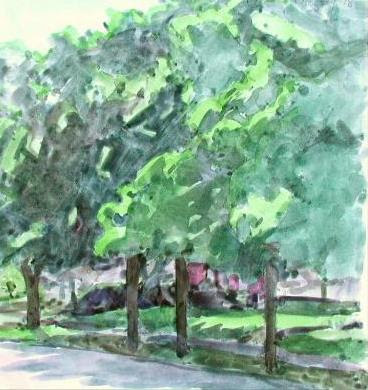 The edging of the trees by the sunshine provided a relief to the monolithic wall of green. When making up two dimensional shapes to create space, it’s fun to juxtapose areas that are almost pure patterns. It’s always a challenge to come up with enough different shades of green while painting in summer – pushing some bluer and others yellower. My angle is looking down Lincoln from Jackson.